VueScan - лучшая и просто незаменимая программа для работы со сканерами. Может работать с внутренней глубиной цвета. VueScan поддерживает автоматическую и ручную настройку большинства параметров и пакетный режим сканирования. Поддерживается более 3000 моделей сканеров с определенным перевесом в сторону слайд-сканеров - Nikon, Minolta, Polaroid, Microtek, Epson. 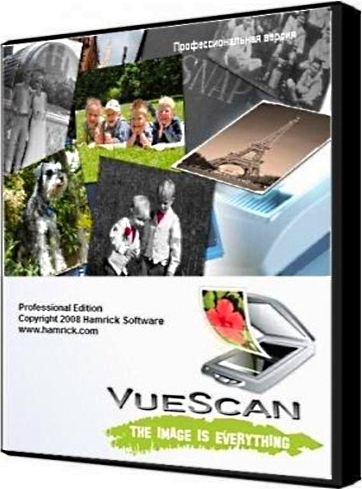 VueScan is an universal scanner software that supports over 3000 scanners and 300 digital cameras. It is the ideal tool to obtain high quality scans with your computer. VueScan, the worlds most popular scanner software, is used extensively by photographers, home users, scanning services and corporations. VueScan is a scanning program that works with most high-quality flatbed and film scanners to produce scans that have excellent color fidelity and color balance. It is very easy to use, and also has advanced features for restoring faded colors, batch scanning and other features used by professional photographers. VueScan changes nothing on your system, installs nothing in your operating system and all other scanner software will continue to function. VueScan increases your productivity and saves you money. VueScan has advanced scanning options, powerful features, and greatly improves your scans with superior color accuracy and better color balance. VueScan supports more than 3000 scanners and 300 digital camera raw files and takes about 5 minutes to download and install.